A chic lab grown diamond pendant necklace featuring a single stone floating in an open, spinning circle of conflict free, round brilliant diamonds. The perfect anniversary gift or gift for a new mother. Available options: platinum, 14k or 18k gold: white, yellow, rose. 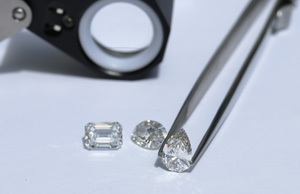 Our Concierge Team will help you design the perfect piece of heirloom quality fine jewelry. Ada Diamonds Design Description- What goes around comes around. This distinctive necklace features round brilliant lab diamonds in a spinning, open circle with a floating larger round manmade diamond set in 14k white, yellow or rose gold. Available in 16", 18" or 20" chain lengths. A perfect anniversary gift, or gift to celebrate a new mother. Starting at pricing assumes GH, VS2/SI1 center lab diamond with GH VS lab grown diamonds set in 14kt white, yellow, or rose gold. Additional setting fees for 18kt: $150, for platinum: $300.